Despite the fact that I was introduced to the concept of "church" late in my teen years and in Southern Baptist circles at that, in a very real sense, I "cut my teeth" on church, as it were, in the (Independent) Christian Church movement. For those not in-the-know, the "Independent" churches, while not an "official" denomination with an episcopacy or president or single central leader, basically function as a denomination. They have an annual national conference, they have scores of Bible colleges and several seminaries around the country, and they are, for the most part, very strict within most of their churches and institutions of higher education about only hiring people produced in their schools. In Kentucky especially, these congregations are everywhere. They are part of what is known as the Restoration Movement, a movement that was birthed and given life at Cane Ridge during revivals. Eventually, however, the Restoration Movement splintered into three. On the far right of the Movement are the Churches of Christ, usually non-instrumental. On the far left are the Disciples of Christ, who tend to focus largely on social issues. In the middle and more to the right, at least in this part of the country, are the Independents. They, unlike the Disciples of Christ, which are a denomination and have a single leader, pride themselves on their independence. In 1999, just after I finished high school and had really just become a Christian, I took off for Kentucky Christian College (now University). Immediately following that, I took a scholarship offer at Lexington Theological Seminary to do my MDiv. The former is affiliated with the Independent churches and the latter with the Disciples of Christ. Both of those times were formative for me in many ways and I have many fond memories of my times there. But it was also during my time at these two places that I encountered Wayne Smith. To date, I have four degrees, including a Ph.D., and am working on a fifth, so I have taken tons of classes. I have sat at the feet of world-renowned scholars and am so fortunate to have done so. But, I have a confession to make: I cannot really remember, at least in a word-for-word fashion, a single meaningful quote from any of those professors. To be sure, they have helped shape and edify me but, at this very instant, I struggle to recall any one course-steering word or quote off the top of my head. The same cannot be said, however, with regard to my encounters with Wayne B. Smith. As anyone and everyone who ever heard Wayne knows, he loved telling jokes...that was his shtick, his thing. Sometimes his jokes were a bit too colorful for the pulpit and sometimes over-the-line, but there was never a thought that he had any malintent; you knew he was just out for a laugh and trying to tap into folks' joyous side. But back to what Wayne said. 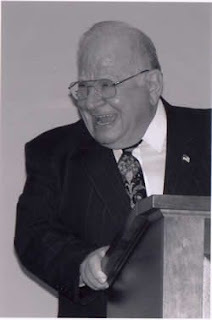 Friends, I have to be honest, one of the first times I ever heard Wayne speak (it was the second time, on the same day, actually), he made a comment that, even though I didn't realize it in that moment, has remained formative in my nearly twenty years of ministry. It's something that many have heard him say. Yet, more than any secondary quote I know, it is the one that I have returned to most; it has, for all intents and purposes, been something of a life motto for me, something I suppose that's a close as a "life verse" as you can get. 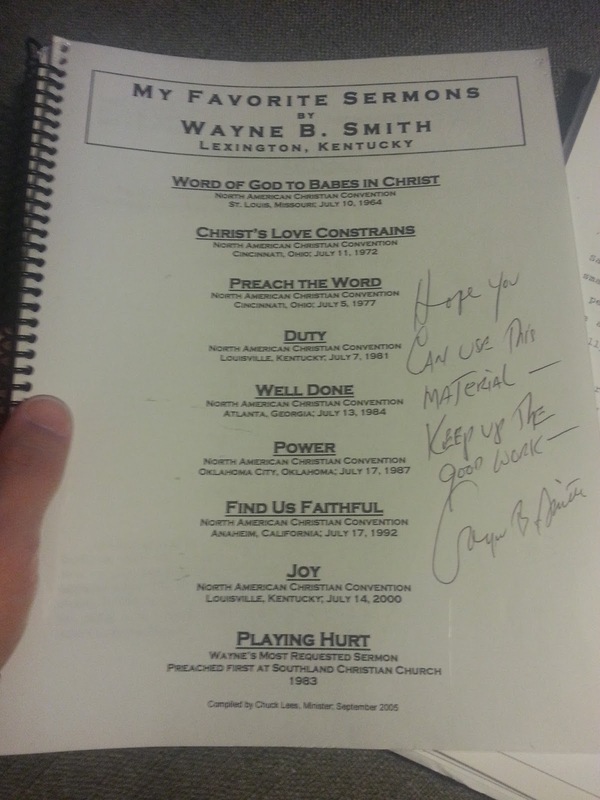 Somewhere around 2000 or 2001, Wayne came to speak in chapel at Kentucky Christian. Everyone loved it; it was a big hyped up day. It was around that same time that a building had just been dedicated in his name. But Wayne also came to my preaching class and spoke to us young, budding preachers, It was there that Wayne spoke and gifted me with that life motto, something I've used in countless sermons to be sure, but even more, something that has be personally formative: "Preach the Gospel, brother, preach it! Put it high, where men can teach it, put it low where men can reach it, preach the Gospel, brother, preach it!" That statement, simple as it may be, is one of the most profound I've ever heard. To me, the call than to preach the Gospel is a great one and there is few greater gifts than the experience to be able to. In a world where the Gospel is often so watered down and so non-offensive and so, well, not the Gospel, the Church desperately needs folks who will preach and teach it, and who will hold it high as they do so. At the same time, however, those same people must keep it at a level where it's understandable. That's the task of one who handles the Gospel: Respect it enough to hold it high, love others enough to bring it to them. In fact, I don't think the "put it low" part of this means dumb it down or water it down; no, it means that, as a preacher, you must also a be a servant. You have to "get low," you have to be a servant before those you're sharing the Gospel with so they will see how wonderful it is and, in turn, raise it high themselves. I wasn't shocked, but I did get goosebumps when Southland Christian Church, which Wayne founded many years ago and is now a massive congregation, shared a video of Wayne and he those were his parting words. He called those words his life motto. Some of the first words I heard from the man were the same as the last I heard from him. And if there's one thing beyond the phrase itself we can learn from that, it's consistency. All these years, Wayne Smith has been a consistent and ardent advocate of the Gospel of Jesus Christ, even in the face of backlash. I've heard many stories about Wayne over the years, even as I've moved out of the Restoration Movement and into United Methodism. I know of his work ethic and how he used lots of "shoe leather" going door-to-door telling the Gospel in the early days of Southland. I had another chance to meet Wayne when, as a young pastor, he came and preached a revival at the church I was leading. It was the annual homecoming service and Wayne did his usual thing: told jokes, told more jokes, made a couple of profound points, and told some more jokes. The place was in an uproar and busting a gut laughing for nearly 45 minutes straight. I had the chance to sit and eat with him afterward and, even then, I felt like I was in the midst of a giant of the faith. The best part of it all, however, was the fact that he was still incredibly humble and approachable. I was only two years or so into that ministry and, about two weeks after that homecoming service, I received a large envelope in the mail. Wayne had taken it upon himself to send me a package. Upon opening it, I found a book of sermons he had written and had spiral bound. 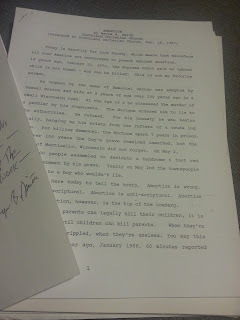 The picture included here is a snapshot of that book; I still have it. The note on the inside cover, handwritten by Wayne to me, says, "Hope you can use this material - Keep up the good work - Wayne B. Smith." I imagine there are other ministers out there with this same exact book (and maybe even the same comment and signature). I heard that just before he died, in fact, he was still at a ministers gathering encouraging preachers, especially the younger ones (and he even noted that he thought that event would be his last - crazy!). But, returning to the book he sent, as the title suggests, these were his favorite sermons; the ones he delivered across his time in ministry and the ones that he loved the most. What a blessing to receive them! I've read them all. There were several others, not bound, that were included. 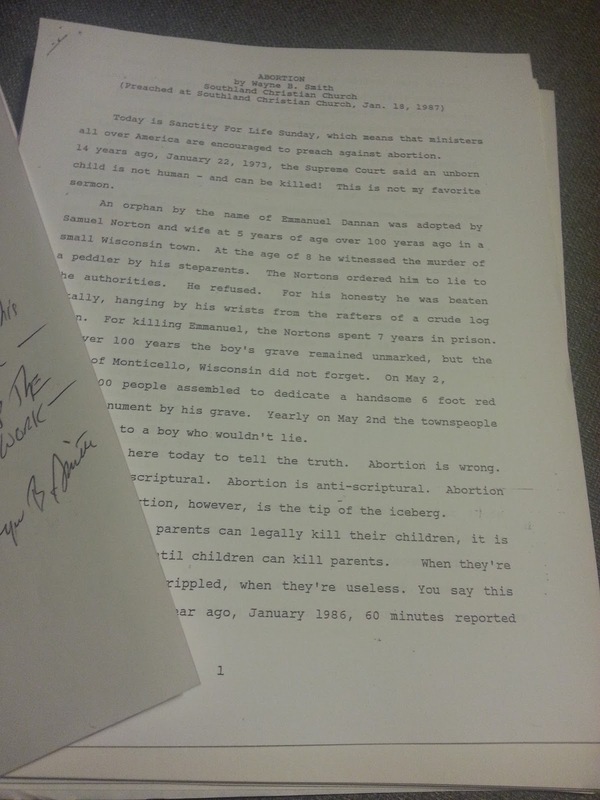 One, which I've included a snapshot of here, was titled "Abortion." This was given at Southland on January 18th, 1987. As I read that again this evening, I was struck by his boldness. Three paragraphs in he says this, "We come here today to tell the truth. Abortion is wrong. Abortion is unscriptural. Abortion is anti-scriptural. Abortion is murder." 20 years on, this is still an issue we need to confront, of course, and we need to tap into that same boldness of the Spirit that Wayne did then. You've seen the book and at least one of the other sermons, but what you don't see here is a personal note he sent me, a word of encouragement. And you don't see the $200 in cash he included. I was surprised but, after thinking about it, not shocked. I realized then what made Wayne "one of the greats," namely, that he wasn't in it for himself but only for the sake of God's kingdom. Unfortunately, I haven't seen Wayne in person since the early 2000s when he visited that little country church I was leading. Still, over the last several days, I've been both saddened and blessed by seeing all the things folks are writing in his honor. I wanted to partake and so I wrote this brief post; it's good to give thanks for our brothers and sisters! I thank the Lord that I got to cross paths with Wayne and, even more, that I got to sit at his feet and learn something that has shaped me over the course of 20 years, something that has never left me. We all say lots of things and most of them pass into oblivion. For me, Wayne's comment has not simply passed by; no, it has stuck. And so, as he says at the end of the video below, and as he said during that class to me at KCU, I say to you, too, one more time: "Preach the Gospel, brother, preach it! Put it high, where men can teach it, put it low where men can reach it, preach the Gospel, brother, preach it! May that be your motto, may it continue to be mine, and may our brother in Christ rest in peace!